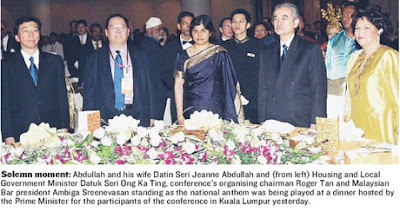 KUALA LUMPUR: The recent allegations of impropriety in the judiciary have not reached an impasse and there is still time to talk, said the Prime Minister. “With regard to the recent Putrajaya march, I would take the view that a public demonstration is not like any other public social event. A demonstration gives the impression that a problem has reached an intractable impasse, even when, in reality, it has not. I believe it has not. We still have time to sit and talk,” said Datuk Seri Abdullah Ahmad Badawi in his keynote address at the 14th Malaysian Law Conference. On Sept 26, some 2,000 lawyers and activists walked from the Palace of Justice to the Prime Minister’s Department to hand over two memoranda - one calling for a Royal Commission to verify the authenticity of the video clip showing a senior lawyer apparently brokering the appointment of judges with a senior judge, and another for the establishment of a permanent judicial appointment commission for appointing judges. On taking positions and advocating measures on various issues, Abdullah said the Bar, quite often took positions seemingly divergent from that of the Government. “We are on the same side and fighting for the same issues but with different style”. Stressing that his Government was not averse to criticism, Abdullah said it recognised the role and contribution of civil society in enabling and ensuring the success of its development plans. He disagreed with the stand of some that the Government was suppressing public opinion, citing the “very public reports that have questioned the efficiency of the government, such as wastage in the civil service” as an example. Abdullah said the Government took the Bar Council’s views seriously and suggested that a more constructive way to resolve differences was to work together without being suspicious of each other. He called on the legal fraternity to work more closely with the Government for the further development of Malaysia’s economy.